World Champions, POWs, Fur Traders and MORE! 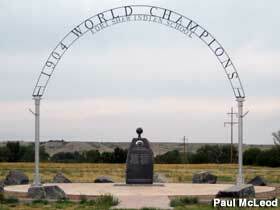 A storied past will come to life in August for a small Montana town of World Champions. In 1867, a fort was built in the heart of what was to become Montana. This fort’s purpose was to protect the growing nation’s interest in the region, and the men hoping to strike it rich in the vast landscape. Fort Shaw, built in 1867, came on the heels of Montana earning statehood. Fort Shaw has gone through many lives during its 150-year existence, and on August 13th, history comes alive at the sesquicentennial for Fort Shaw. The Sun River Valley Historical Society will host a celebration in honor of Fort Shaw’s lasting historical importance to the region. The celebration will begin with a flag raising ceremony, Sunday, August 13th at 10 am with a flag raising ceremony, followed by a day of exploration. Guests can tour the 150-year-old fort with guidance from interpreters throughout the day. Re-enactors show what the fort was like in its early days. In its first life, Fort Shaw was built in 1867 to protect Mullan Road, a vital trading, and transportation route that connected Fort Benton and Fort Walla Walla. Fort Shaw served as the regional headquarters for the entire Montana Territory and was highly active during the Indian Wars from 1867 to 1891. After serving as a fort for 24 years, it was repurposed as an Indian industrial school. 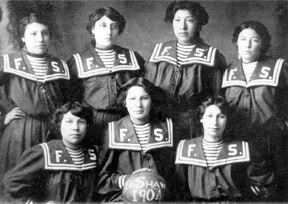 The school remained until 1910, but became famous when its girls basketball team won the World Basketball Championship at the St. Louis World Fair in 1904. All that remains today of the school is a memorial to those amazing basketball players. During World War II, the fort became a POW camp. German prisoners were captured in Africa and delivered to Fort Shaw to work the beet fields. However, as time passed, Fort Shaw began to fall into disrepair, and that’s where the Sun River Valley Historical Society comes in. For over 40 years, dedicated volunteers have worked to prevent the loss of this historical treasure. In January 1985, Fort Shaw was added to the National Register of Historic Places in part because of the group’s dedication to preserving what remains of Fort Shaw. At its peak, the fort comprised 64 buildings; today there are only 6. However, progress is being made to rebuild the ruins as accurately as possible. The Fort Shaw Anniversary is a celebration of the past, and fundraiser for the future. Visitors can rebuild a piece of the fort by purchasing a memory brick. These bricks will be used to restore fallen tower. A sesquicentennial only happens once, so don’t miss the Fort Shaw 150th anniversary. Fort Shaw is an easy drive from Great Falls, and during the weekend of the anniversary, including the Great Falls Farmer’s market, where farm-fresh produce is available from many of the farms you will pass on the drive to Fort Shaw. Come in early for the Fort Shaw festivities and stay in Great Falls. Enjoy Music on the Mo, enjoy the Bison Exhibit at the CM Russell Museum, the Lewis and Clark Interpretive Center, Giant Springs State Park, the History Museum, and Malmstrom Air Force Base Museum.